We returned to our boat & headed for our lunch in a beautiful stilt house restaurant by one of the small canals fed by the lake. Our guide recommended two local dishes for our starter, deep fried eggplant with chilli dip sauce & rice cooked in banana leave parcels. These were an excellent choice. After lunch we began the afternoon hotel inspections in Inle Lake starting with the 3* Shwe Inn Tha. 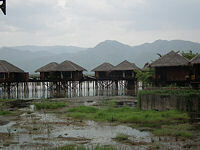 This is an excellent 3* hotel with all hotel rooms built over the water in traditional local stilt house style. Each of the thatched roof cottages built over the lake blends in very well. There is a small patio deck at the front of each cottage with chairs to enjoy the lovely environment. The rooms are large & bright, decorated with wooden wall & floor panels in local style. 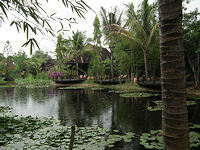 The hotel has a long decking walkways leading from one place to another giving a wonderful feeling of walking on water. There is a swimming pool at this resort for relaxation among the natural landscape of nearby farms & lake. This is one of only 2 hotels on the lake to have s swimming pool - the other one is the 5* Aureum Palace hotel. At the 4* Lake View hotel in our superior hotel category we stepped off the boat onto wooden steps leading up to a platform & onto a long decked pathway shaded by large banana leaves on both sides, leading to a stone pavement through mature gardens up to the hotel.The hotel is decorated in an elegant boutique style. All rooms are large & stylish with balconies looking out to the gardens and the lake beyond. 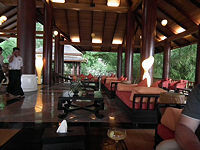 The hotel restaurant has the best presentation of all the hotels in Inle Lake. Although this hotel is located on land it is the very stylish & one of the best presented hotel in the area. Afterwards we went over the lake to the Inle Princess Resort. This hotel will not allow noisy motor boats to disturb its guests, so we picked up a skilled oarsman to row us the last 200 meters or so to the hotel. Here there are two types of rooms, one facing outward to main lake & the other faces a beautiful small private lake and the gardens. This second type has a large deck with sun lounge outside the room The gardens & lake are the most beautiful I have seen in a hotel environment. The lake view rooms have balconies to enjoy the lake. We will carry on using the Inle Princess Resort in our deluxe hotels category. Near to Princess is the Aureum Palace hotel. This is a new member of the Aureum chain hotels recently opened in Inle Lake. Unlike other resorts in the lake the arrival to this hotel is the least unremarkable. The large concrete bungalow built above the lake look slightly out of place in this natural environment. The beauty of the hotel only became apparent when we reached the lobby & the hotel accommodation. The design of the lobby & its colour is stunning & imposing. The rooms are large & stylish. The bath room has a separate shower room & a separate room for a round wooden bath tub. There is also a corner space with long sofa for sitting. This is the second hotel in Inle Lake with a swimming pool. The clouds has darkened & it had become very overcast. We saw the first rain drops of the wet season. It was just a light rain & did not last long. Next morning we were back to the hot & sunny sky. 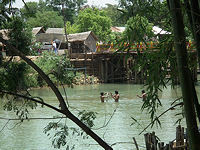 We got up early for a long journey from Inle Lake back to Heho, then Yangon and onwards to Kyaikhtiyo. We chose to have a lighter breakfast with a bowl of local Shan noodles. I would recommend anyone staying at Villa Inle Resort & Spa to try this breakfast. It was lovely & tasty. The white flat noodles were cooked in simple tomatoes & chilli sauce. No meat but simply refreshing. 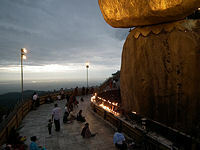 Our flight arrived back at Yangon & met up with Kyaw again to began our 4-5 hours car journey to the famous Golden Rock. We stopped for lunch on the way & arriving early afternoon. Our guide told us that the fun of going up to Kyaikhtiyo had just begun. First we have to join any truck going up that afternoon. The truck would not go until the back of the truck was completely full of about 40 people sitting closely on wooden benches. This is the only way up the mountain. Visitors & local people are all sharing the truck in the same way. I must warn you that if you wish to make this trip to see the Golden Rock the truck journey is not the most comfortable. The truck tends to drive very fast going uphill & along the winding road. We were swinging from side to side on the back of the truck. Our guide, Kyaw, was not that well that day so he became sick in the truck. The truck stopped a few times for him to rest. Finally he had to be dropped off half way & went back down himself. The truck finally stopped at the Kin Pun Base Camp after about an hour. We were still not at the summit of the mountain yet. We were now standing in a large area thronging with visitors waiting for rides the rest of the way by palanquin, carried by four local men. The passenger sits in a canvas and wood chair in the middle tight between two bamboo poles. There are only two choices, to go up either ny palanquin at $8-$10 US Dollars or walk up the very steep hill for about one hour. We brought our tickets & began our journey uphill in a palanquin each. 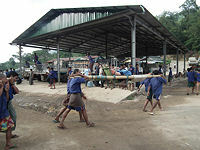 For us the palanquin journey is more comfortable than the truck journey but it is very hard work for the men doing the carrying & walking uphill. I began to feel sorry for them. I asked many times that they should stop for a drink. Our guide has warned us that they would want drinks on the way up. Finally they stopped at a chosen shop for a rest. As soon as we stopped a young girl from the shop rushed out with four cans of cold drink for them & asked me for the money. It was $2 US Dollars per can. I was reluctant to pay the shop girl (not the 4 workers) as I felt it discredited these men's hard work for the same price of a can of soft drink. I later found that the 4 men did not drink the can drink but probably returned to the shop to collect a credit. I was thinking to pay them double fees when we reached the top, the same as I paid to the shop. I did pay them extra on the top but not as much as I would have done if the drink from the shop was not involved. We checked in the Mountain Top hotel. This is a simple hotel but in the best location on the main street within walking distance of the Golden Rock temple. The room is basic but it is clean, bright & comfortable. We have been using this hotel for many years now & will carry on using it for this Mountain Rock overnight stay. That night on the 5th of May was the birthday of Buddha so the crowds were gathering round also for the full moon ceremony. 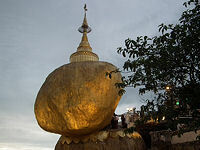 The Golden Rock is a unique & magical monument with one large rock in gold dangling on the edge held up (according to local belief) only by several hairs of the Buddha in the stupa on top. The atmosphere is charged up tonight by the crowds lighting candles for their prayers & meditations throughout the night. 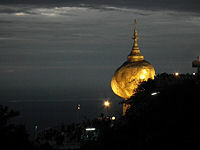 The golden rock began to shine brightly as the sky became purple in the light of dusk. The glinting shoulder of the golden rock was now even more magical in the dark. It is stunningly beautiful. For all the hard work to come up here it is worth the trouble. Next morning we walked down to the station to get on one of the many waiting trucks to go back down to the town. We met up with Kyaw & to start our return journey to Yangon. On the way we also visited Hanthawadi Palace & reclining Shwethalyaung Buddha pagoda. We arrived in Yangon & and met our Myanmar office director, Mr Mindin, for lunch. I told him that I feel, like many of our clients, I wanted to come back to Myanmar very soon. Myanmar is a beautiful country & I am very happy to plan my next fam trip back in a year's time.